“I don’t care if I never eat a dill pickle again,” said Adam, a few weeks ago. It might be overload—I’ve gone crazy with the lacto-fermented dill pickles in the recent past. 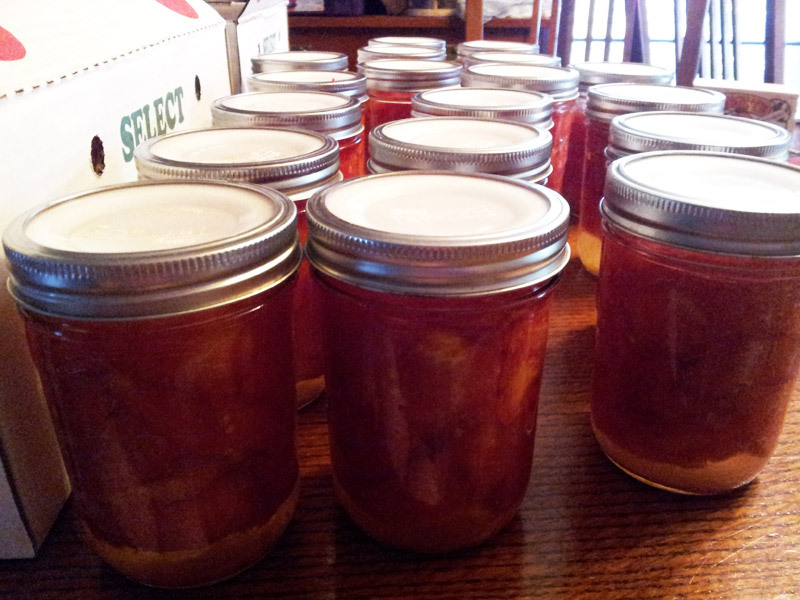 Also: many of my 2011 jars went bad. My best guess is that I was skimping on the salt; nearly every jar I opened over the fall and winter was full of mushy, bad-smelling, heartbreaking, compost-bin-bound pickles. The experience put me off a bit on my former go-to recipe. This year I vowed to try some new things with cucumbers. 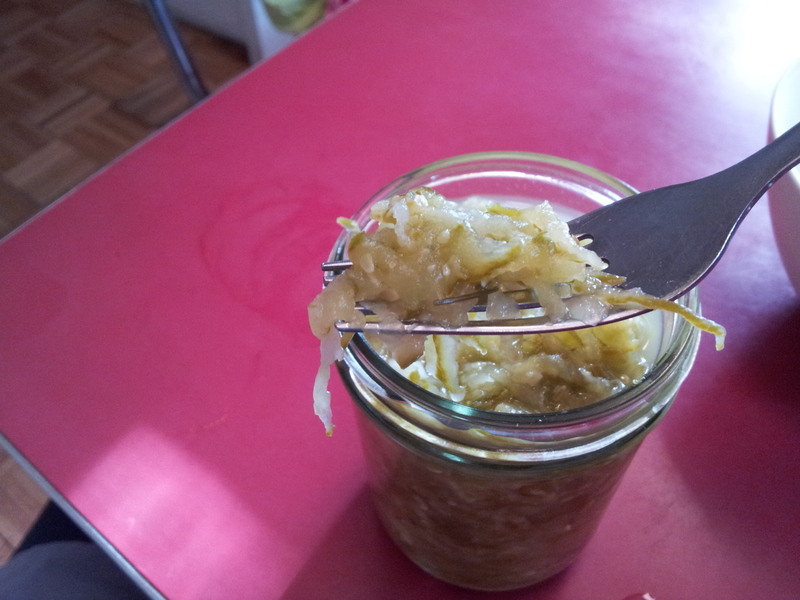 One has been this recipe for lacto-fermented bread and butter pickles. I’ve made several batches this year and the kids and I both love them (pro tip: don’t skimp on the honey). I also wanted to try a nice savory, dilly, garlicky relish. My first batch involved a bit too much salt and ended up taking almost a month to get properly fermented. Second batch, I used a bit less salt, and so far so good. 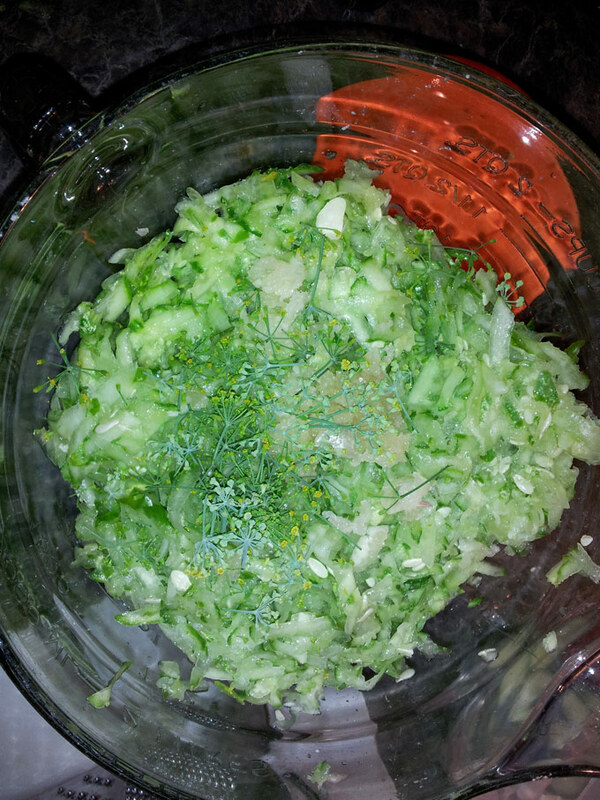 Grate the cucumbers until you have about 6 c. grated cucumber. Add other ingredients. The cucumbers will start to reduce as soon as the salt hits. Let sit for a few minutes, then pour off some of the excess liquid. Stuff into a quart-size wide mouth canning jar, making sure there is still enough liquid to cover the mixture as you pack it down. Next, find something to hold the relish down under the surface of the liquid for a few days while it ferments. I like these plastic bulk-section bottles from the co-op, filled with water. 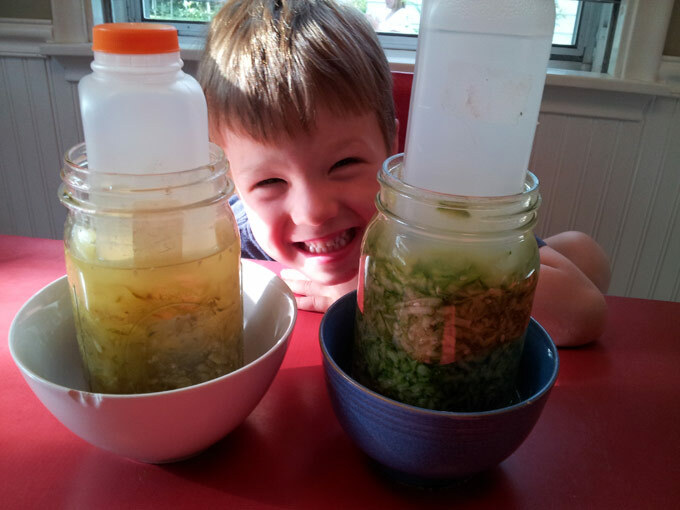 On the right is a brand new, bright green batch, and on the left is the batch that is done fermenting. When not being photographed, they rest under a flour sack towel to keep out dust, dog hair, etc. The cucumbers will continue to reduce down as they ferment, to the point where I actually transferred the finished batch into a pint jar when it was finally ready. How do you know when it’s ready? Taste it every other day or so. When it stops tasting salty and starts tasting complex and dilly and garlicky and wonderful, it’s done. Put a regular canning lid on it and store it in the refrigerator. It should keep for a good 4-6 months, but let your nose and your taste buds be your guide on that. I had some atop a Ukrainian sausage from Seward Co-op today and it was heavenly. Categories: Cooking and baking, Gardening, Practical | Tags: Fermentation, Nourishing Traditions, recipes | Permalink. 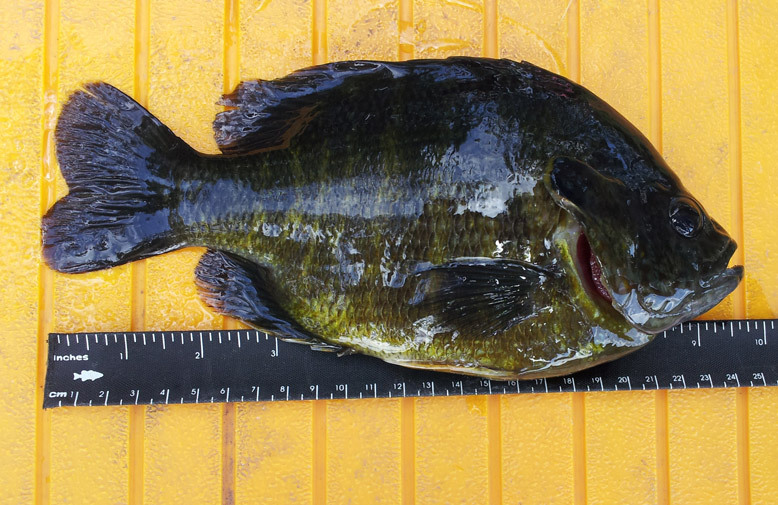 Back in April, I applied for a grant from the Minnehaha Creek Watershed District. Their stormwater best management practices cost-share program helps homeowners in the district pay for landscape projects that help reduce run-off and support wildlife. I figured my back yard landscape project was a good candidate with its native plants and the rain garden. Found out last week that I got the grant! It should cover all the plants. Awesome! Knowing that the funding was secure, I bought the rest of the plants needed to complete the project this weekend. 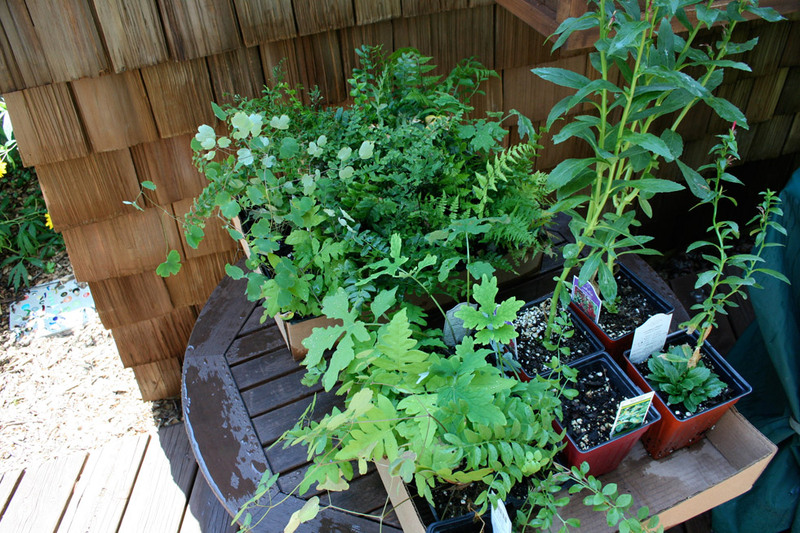 Fortunately Mother Earth Gardens in Minneapolis had everything I needed (mostly ferns). 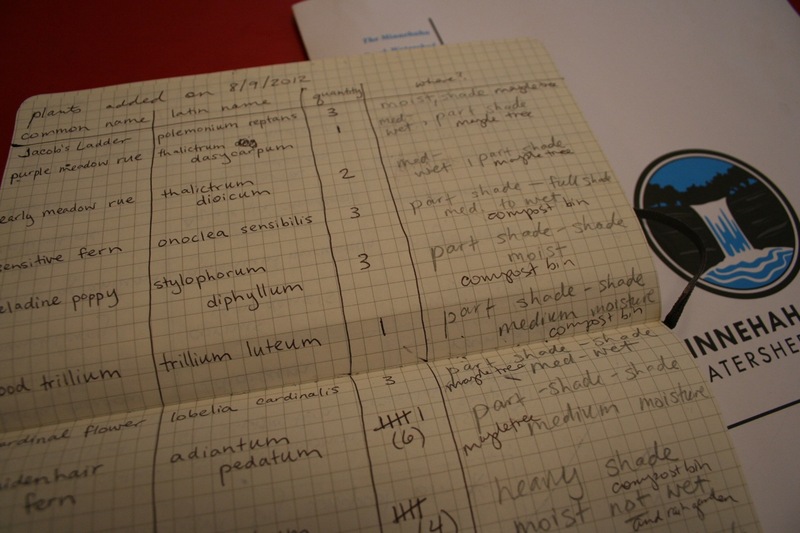 First I wrote down the common and latin names, quantity, and location preferences for each plant. I can’t emphasize enough the importance of at least jotting down the latin name of each plant you buy. If you don’t, it is very difficult to know exactly what you have a few years from now. Then I set the plants, still in containers, in their places to be sure of arrangement. Many of the plants I put in this spring are still tiny in their rabbit-proof cages, so I hope they survive the winter. 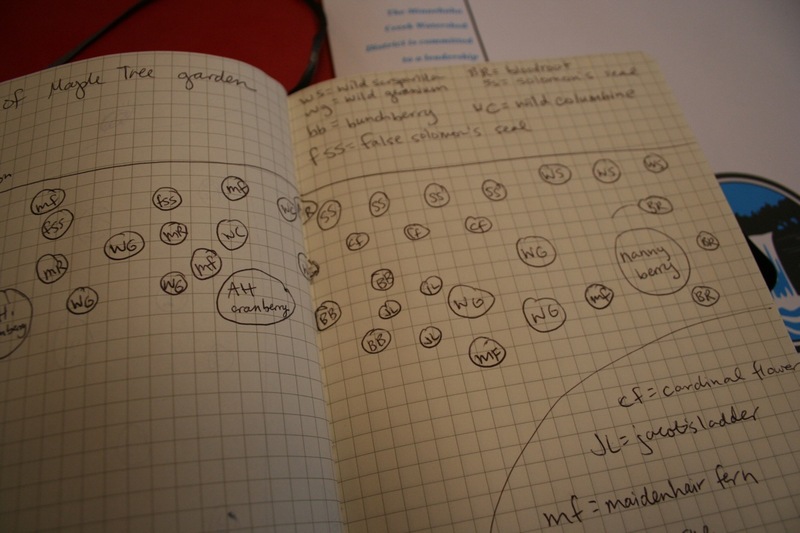 Next I made detailed maps of each planted area. This will be a big help next spring. 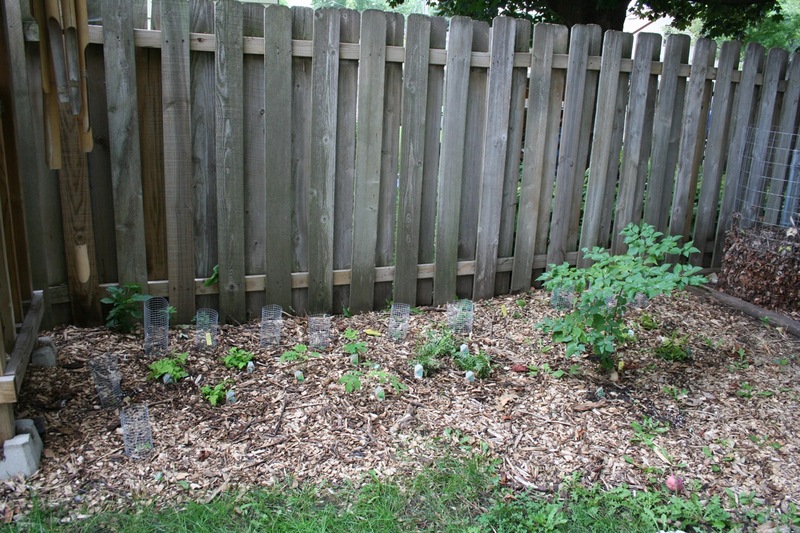 One of the three planted areas: a deeply shaded area between the compost bin and the wood shed where no grass has ever grown. 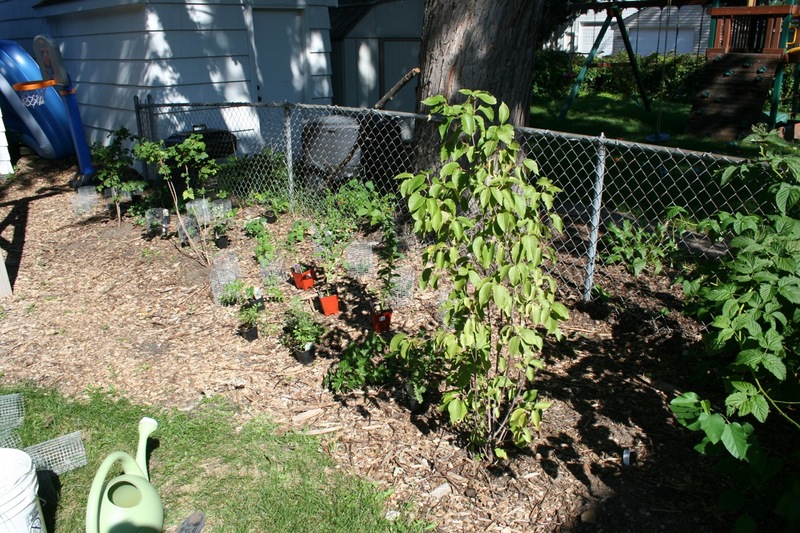 The shrub in the picture is a alternate-leaved dogwood, also called pagoda dogwood (cornus alternifolia). Originally I had this area marked as “leave empty for potential chicken coop” but Adam put his foot down about the chicken issue. Plants it is. For now. The other large planted area is along the north fence line, under a beautiful mature maple tree. It’s not much to see right now, but it should look much more filled-in next year. In a few years the 3 viburnums (2 trilobums and 1 lentago) will hopefully get big enough to provide a bit of screening. 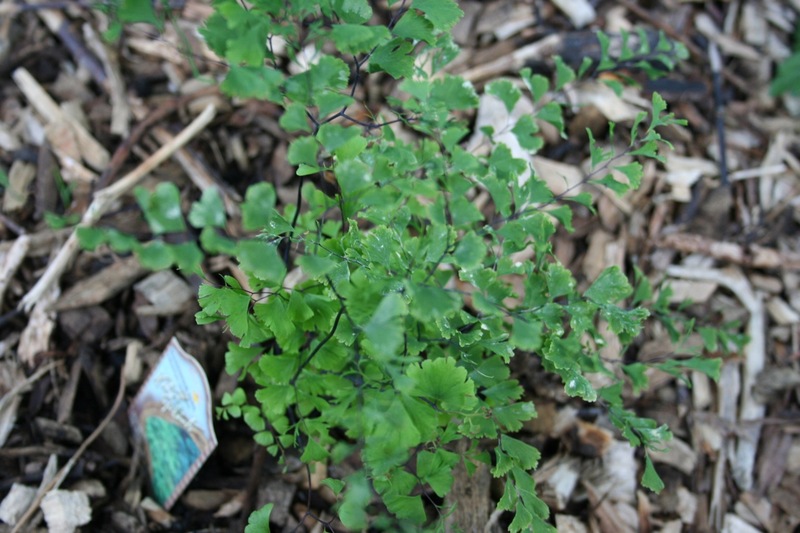 I added six of these maidenhair ferns (adiantum pedatum). They are a great groundcover. I was so jazzed to find Christmas Ferns (polystichum acrostichoides) that I bought 5 of them even though I technically only needed two. 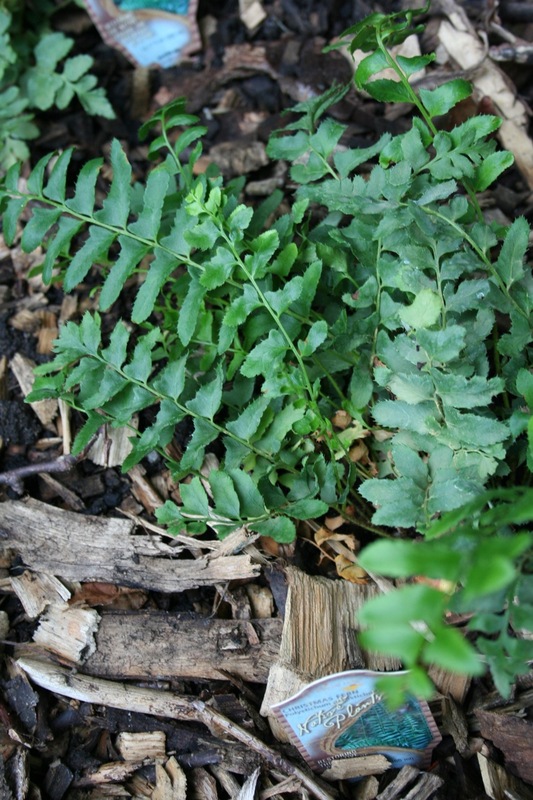 They’re an evergreen fern often used in holiday floral arrangements; hence the name. 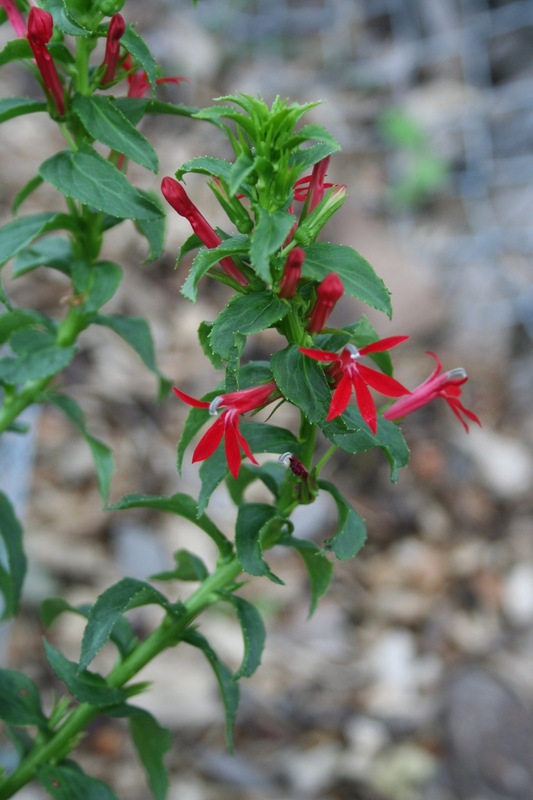 I also added some cardinal flowers (lobelia cardinalis), though not in the rain garden as originally intended. They need a bit more sun than I originally thought, so they went into the sunniest part of the maple tree garden. I definitely varied from my original plan, but the differences are relatively minor. Also, the edges of the rain garden need a bit more contouring before I post pictures. I cannot wait to see all of this next year! 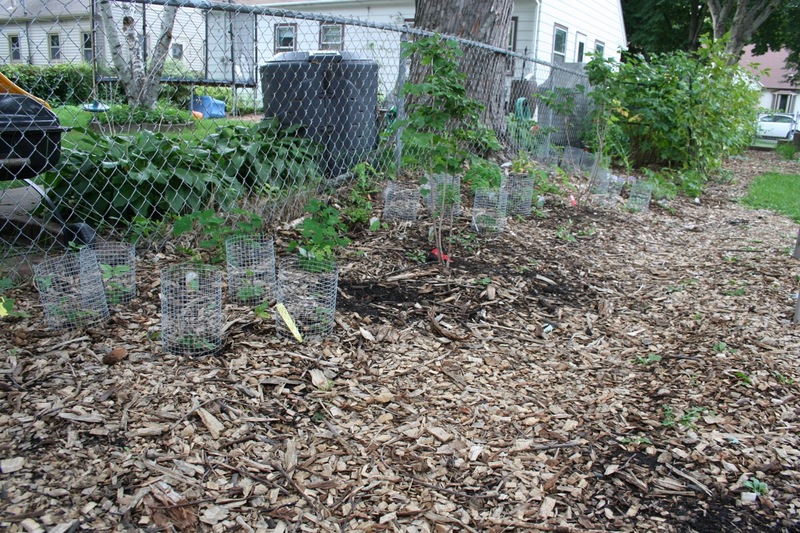 Categories: Gardening, Practical, Water/energy efficiency | Tags: native plants | Permalink. 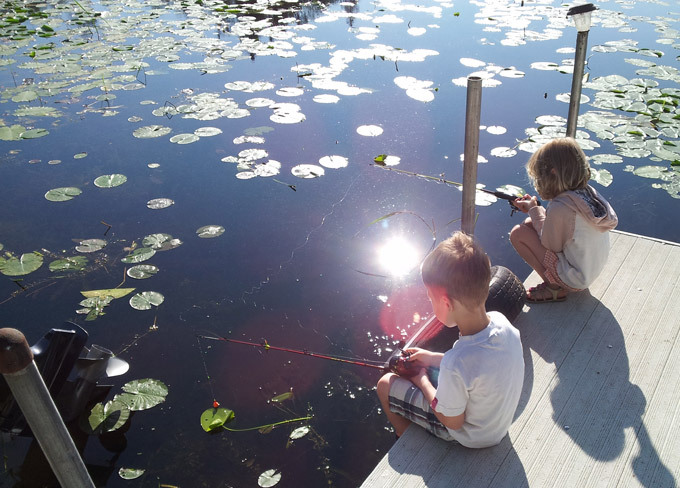 We finished off July with a weekend “up north,” where the kids caught some impressive sunnies right off the dock. They are such good little Minnesotans. When we got back from the lake, our cucumbers had gotten out of control. I shredded up the biggest ones for some relish. It’s still fermenting, but as soon as it’s done I’ll post a recipe. 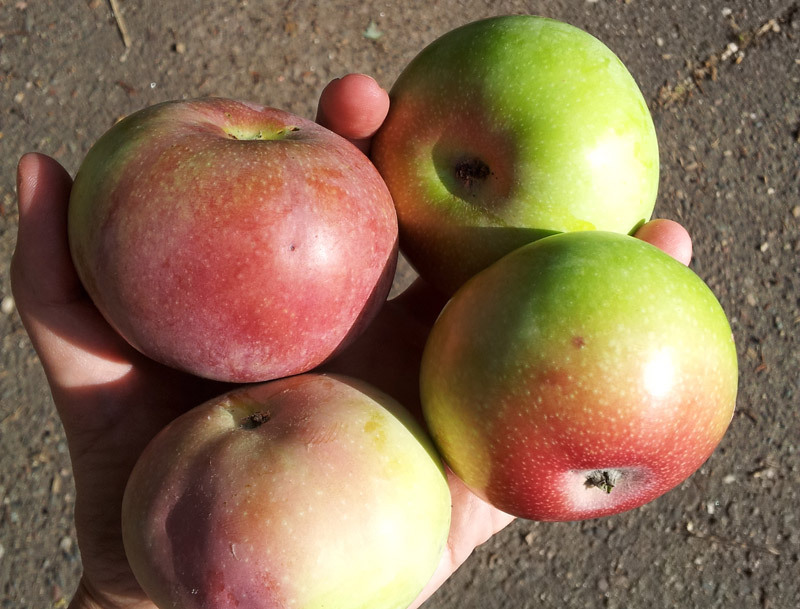 The few apples that our tree produced are starting to ripen. Squirrels are taking most of them; I doubt we’ll get more than a few. I canned 20 lbs of raw tomatoes with Tattler lids. Yay for BPA-free canned tomatoes! Gardens of Eagan has 20 pound boxes of canning tomatoes for $16—naturally I bought two. 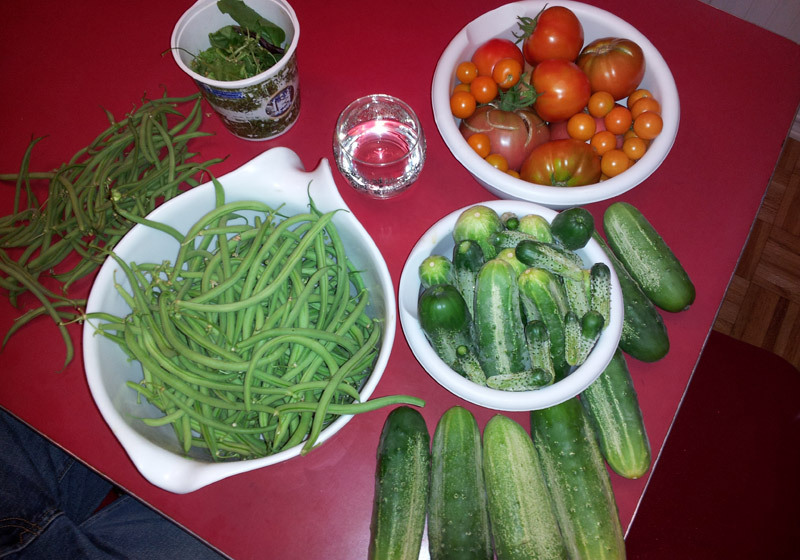 My garden’s not quite big enough for canning quantities. 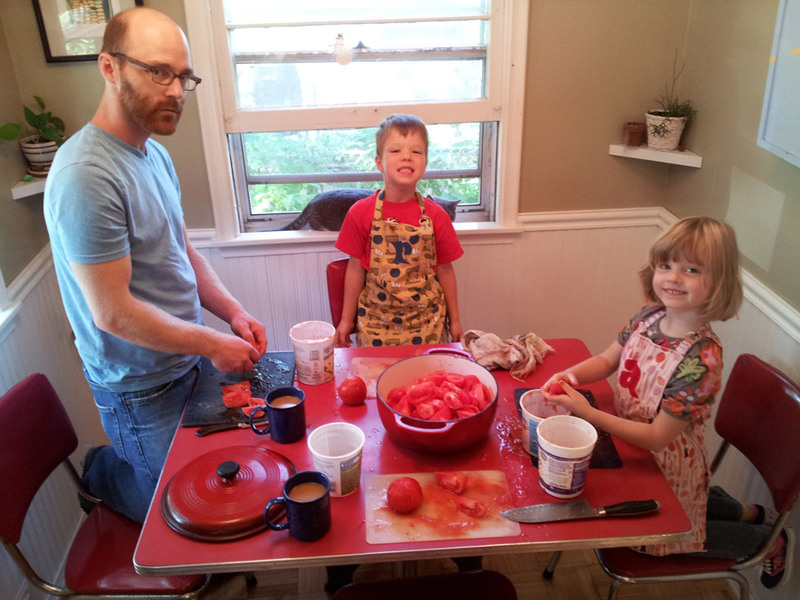 The next day, Adam and I were too tired to do it all over again, so the kids helped with the second box of tomatoes. They were great at peeling and de-seeding. 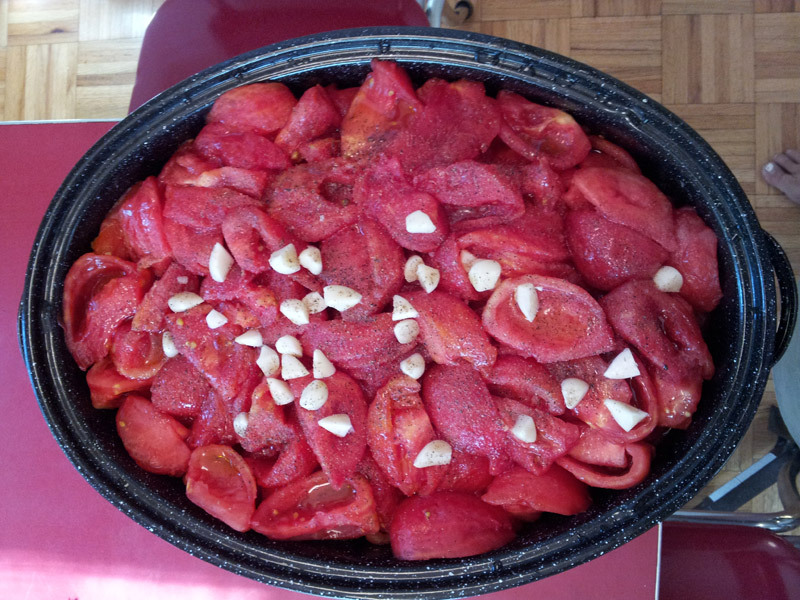 Why roast a mere 5 lbs of tomatoes when you can roast 20 lbs? 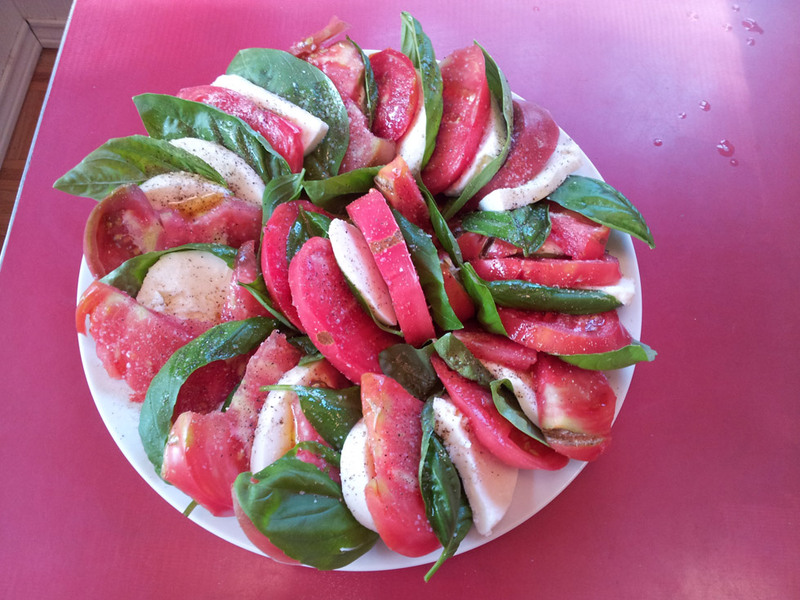 The most beautiful caprese salad I’ve ever put together. Not that it’s super hard. But I had doubts as to whether my neighbors deserved a salad of this caliber for National Night Out. Herbs from a neglected community garden. If I take on any more charity projects my own garden is going to be swallowed up in weeds and giant cucumbers. 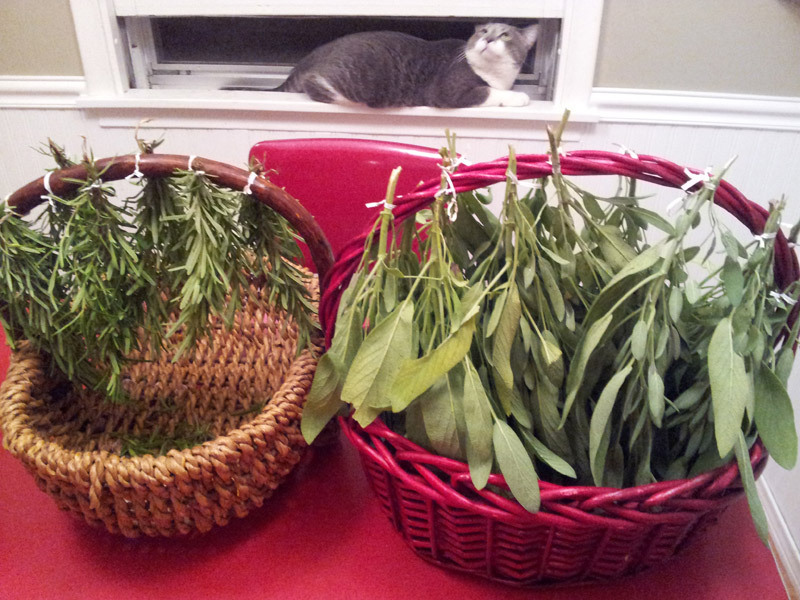 Also: I now have enough sage for ten Thanksgivings. Categories: Gardening, Practical | Tags: apples, Fermentation, tomatoes | Permalink.